Sometimes you know a recipe is a keeper. The minute I saw this chicken recipe in Bon Appétit I knew it would be great. Normally I change recipes up quite a bit, but in this case I only made a few minor tweaks – and ended up with a simple and flavorful dinner that I will be making again (and again). The ingredients are straightforward and likely already in your kitchen, and the whole dish may be prepared in less than 45 minutes – perfect for the weeknight. So file this one – you won’t regret it! Slightly adapted from Bon Appétit. Serves 4 to 5. Whisk oil, garlic, paprikas, cumin, 1 teaspoon salt, pepper and crushed red pepper in a small bowl. Transfer 1 tablespoon of the oil to another bowl and whisk in the yogurt. Set aside until serving. Place chicken, skin-side up, on a rimmed baking sheet. Rub all over and between skin and meat with 2 tablespoons of the oil. Place tomatoes, chickpeas and half of the cilantro in a bowl. Add remaining oil and stir to coat. Pour onto the baking sheet around the chicken. Turn to coat the chicken with any extra oil. Be sure to keep the skin side up for roasting. Sprinkle with 1 teaspoon salt. Totally agree, this looks like a keeper! Wish I could learn to take overhead shots – lovely. this sounds like a great healthy recipe! I made this tonight. I love the way the chick peas get roasted. Only difference, I baked the chicken for about 50 minutes, and it was tender and juicy. This is a great recipe! You make chicken look gourmet! This is fantastic. This such a gorgeous, tempting photo, Lynda! Thank you for sharing this chicken dish – I can’t wait to make it and can already see why it’s a keeper. Love one pan roasts like this…looks perfect! I baked the chicken for about 50 minutes, and it was tender and juicy. This is a great recipe! 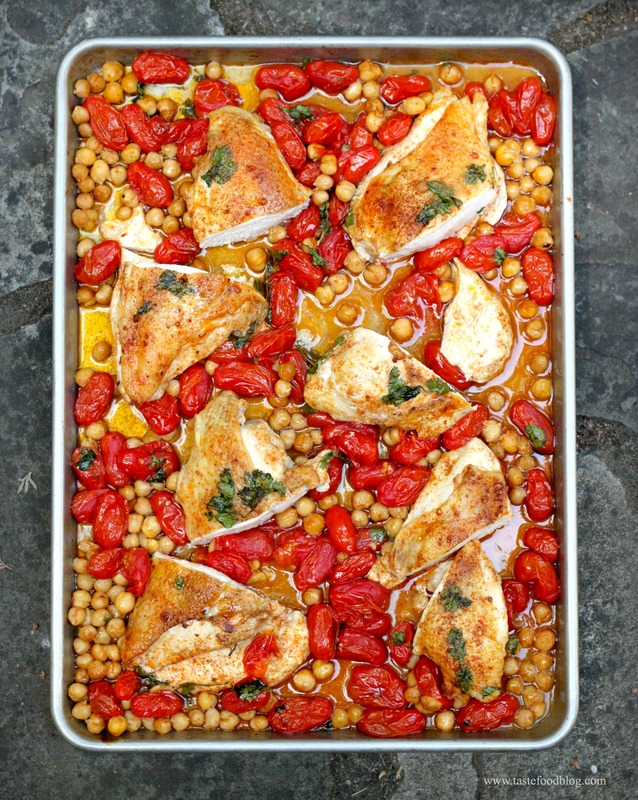 I featured your great recipe for Smoky roasted chicken breasts with tomatoes and chickpeas on my Healthy Recipes Blog Carnival today! I hope you’ll stop by and check it out. Hi, dumb question here but can any cut of chicken be used in place of the breasts? We really like thighs as they seem to be more flavorful and less prone to drying out! Thanks! Yes – just adjust cooking time accordingly. We made this tonight and it was amazing! Didn’t change a thing. So easy and so good- especially the dip.